Find helpful information on local and national cancer resources to help with questions and concerns. Learn about our advanced cancer treatments including chemotherapy, immunotherapy, radiation therapy and more. View specific cancer types and learn about diagnosis, staging and treatment options. When you have cancer, even the most joyous of holidays can leave you feeling sad. On top of all the physical stresses, the thought of missing out on your traditional get-togethers can make it hard to get into the holiday spirit. Of course, you should first talk to your cancer care team before the holidays to determine what would be reasonable for you. Sometimes travel isn’t recommended; however, for some, it can be done as long as you have a solid plan in place. Your plans should include what to do if you experience new pain or side effects while traveling. Because cancer patients tend to have a lowered immune system, it’s easier for you to get sick from being near people who may not even show signs of being sick, but carry the virus or bacteria with them. Therefore, some patients choose to stay close to home and avoid groups of people to hopefully avoid catching a cold, the flu, or some other virus. Fortunately, we live in a day and age that offers us more ways than ever before to reach out to family and friends during these special times. Below are 3 ways you can easily stay in touch with your loved ones during the holidays. While it’s not perfect, using these tools can help make it the next-best-thing when you can’t be together in person. While text messages and emails can be sent at any time, phone calls and video chats often need to be scheduled. If that’s the case, it can be helpful to set up a designated day and time for your next talk before you end your conversation. 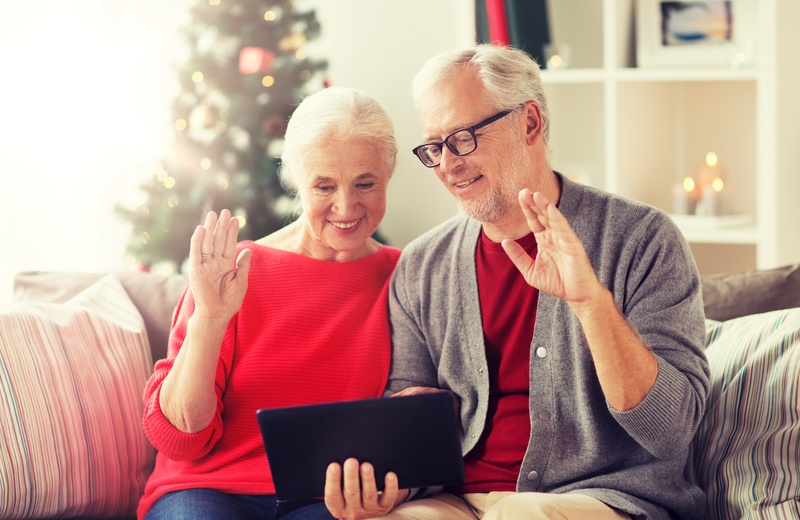 Social media can be a convenient way to stay up to date on the latest things happening with friends and family both during the holidays and other times of the year. Each platform has its own unique characteristics regarding how you communicate. Some are more focused on the written word (e.g. status updates), while others are geared more toward sharing pictures and videos. Think about what appeals to you most and choose the one(s) that makes staying in touch the easiest. Social media makes it easier than ever to share things like what’s on your mind, how you’re feeling, and what you did for the day. As a cancer patient, this can be a useful tool to keep friends and family members in the loop regarding the experiences you have along your cancer journey--not just during the holidays, but on a day-to-day basis. In addition to staying in touch with loved ones, social media makes it possible to connect with others who understand what you are going through. There are several online groups comprised of other cancer patients, survivors, and caregivers who are there to share their own stories and wisdom. Whether you’re savvy with technology or not, there’s something special about receiving a note in the mailbox rather than your email inbox. This holiday season, take time to reach out with a handwritten letter or card. Let your friends and family know how you are doing and encourage them to write back telling you how they’ve been. It may take a little longer to connect, but that extra effort is something that will be remembered and appreciated. Another way to show someone you’re thinking of them during the holidays when you can’t travel to be with them is by sending a care package. You can either put together the care package yourself or have one prepared and sent by a delivery service. The holidays can also be very difficult for the friends and family members of a person with cancer. If your loved one has been diagnosed with cancer, you too can use one of the methods above to show your love and support. It’s important to remember that there’s no right or wrong way to celebrate the holidays. Cancer may bring challenges during this time, but staying connected with the people who matter the most can help keep your focus on the true joys of the holiday season. 9 locations including Chesapeake, Elizabeth City, Hampton, Newport News, Norfolk, Suffolk, Virginia Beach, and Williamsburg. Virginia Oncology Associates ©2018 All rights reserved.